When I was asked to write about Nelson Mandela, I had very little knowledge about the man, or apartheid or the oppression that happened. After reading about him, I instantly understood why he was so great. The idea of a rainbow nation, of equality, of peace and of freedom, which he was so prepared to fight and die for, that was a dream that he dared to live. It was a dream for many people in his nation, but he was the man who dared to stand up and actually do something about it. Talk about obstacles in his dream, he had many…too many, but 27 years of imprisonment, hardships and sickness did not stop him from pursuing his dream. What I know about this great man is very shallow, but the admiration I have for him is vast and I know I share the same view with a lot of people. I’m writing this piece for I Share Hope, a motivational podcast that shares true inspirational stories of hope. We ask our guests five questions about hope. One of those questions is, “Who has shared the most hope with you?” Many have answered parents, siblings, children, friends, mentors and some answered Nelson Mandela. 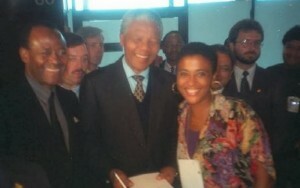 Another great example of Mr. Nelson Mandela giving so much hope is through the different foundations he has. Mr. Tafadzwa Nyamuzihwa was amongst the Mandela Washington Fellowship for Young African Leaders. He was recognized by this initiative and was awarded for being a leader of hope despite all the circumstances in life he had to go through. I think that was one of the best things about Mr. Mandela, he knows his opinion matters and he uses that power to inspire people around him who, in turn, share the inspiration to more people. Amy Bodden-Bowllan, Andrea Harrn and Tafadzwa Nyamuzihwa are just three of the many people who were inspired by Nelson Mandela’s hope but the inspiration did not stop there. These men and women have taken this inspiration and shared the same to many in their own ways. The battle for equality, freedom and social justice is still being fought in a lot of nations around the world and Nelson Mandela’s story is a great example that there is hope that one day things will get better. If every person in the world would choose kindness, no matter how small or irrelevant it may seem, it could still be a spark that starts a fire. Nelson Mandela made it easier for us because he did start a fire, but it’s up to us to keep the fire burning. That one tiny flame you have, protect it, don’t let it die – let your light shine and spread the hope!